Holidays in Tuscia - Springtime has begun and the beautiful, fresh, sunny season has much to offer! One of Tuscia’s most loved and unique springtime attractions is the San Pellegrino in Fiore Festival. Each year locals and visitors join together to enjoy flowers and plants of all colors and varieties, which fill the streets, windowsills, and antique fountains of Viterbo’s medieval district. The warm spring weather also serves well for outdoor adventures in Tuscia. Within the region, there are many hiking options, scenic waterfalls, archaeological sites and gardens to visit. The Bomarzo Monster Park, filled with various monster sculptures is a unique attraction adored by many. For music and wine lovers, a trip to Tuscia is a must! The Tuscia In Jazz Festival is held each spring, offering jazz concerts throughout various indoor and outdoor locations in the region. 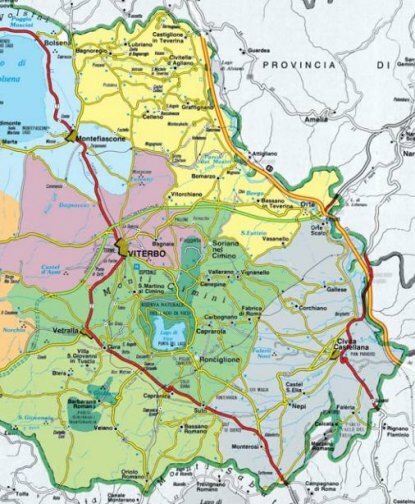 So why don't rent a car from Rome Fiumicino Airport and head north an hour towards Tuscia and book your hotel in the nice village of Viterbo. Tuscia can be easily build in of a self drive tour to Tuscany and Umbria. So you can do a nice 10 - 14 day road trip in Italy from and to Rome exploring Tuscia, Tuscany and Umbria. 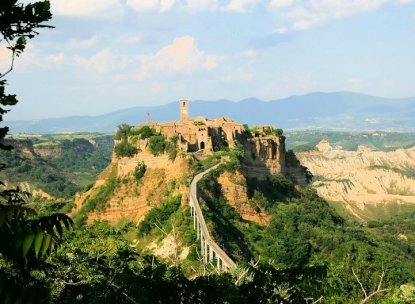 The ancient area of central Italy, known as Etruria, once covered the part of northern Latium which corresponds to the modern-day Viterbo province. Around the 8th century BC, this land was the home of one of the most important of the ancient civilizations – the Etruscans. Around the 9th century BC the populations had to begun to abandon the higher lands they had settled on up till then and were moving towards the plains and hills which would become the main Etruscan settlements. The first settlements were the groups of villages clustered together and built in wood and clay, the huts round, helical, rectangular or square in form, placed at equal distances from one another, leaving enough space to cultivate the land. Once they began to farm the land, they grew many types of crops, but favouring cereals. Very interesting was also the creation of vineyards – indeed it was the Etruscans who must be credited with the first studies into the cultivation of grapes, the taking of cuttings and propagation techniques and, thanks to the mild climate, the growing of olive trees. 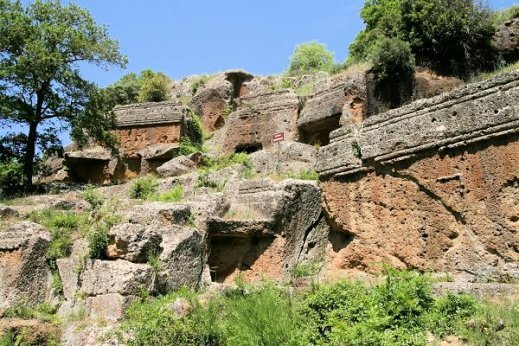 The Etruscan civilization is associated with the mining and working of metals, and they were the main producers of ironware in the Mediterranean, which they exported by sea from the towns of Cerveteri, Vulci and Tarquinia. The cult of the dead was central to this civilization. The tombs of those belonging to aristocratic families reproduced the forms of their homes and contained vases and pots, ornaments, weapons and jewellery. In some tombs, such as those found in Tarquinia, the walls are decorated with paintings depicting scenes from daily life – banquets, dances and hunting scenes, allowing us a clear idea of what the customs and traditions of this extraordinary people must have been like. Norchia, near the town of Vetralla, is one of the most important rock necropoli. Inhabited since the Bronze age, it has terraced dice or false-dice tombs dating from the 4th to the 1st centuries BC. The most visible necropolis is the one named Fosso del Pile. The most interesting tombs can be found along Acqualta stream. Norchia reached its highest glory as a settlement between the 4th and 3rd centuries BC.